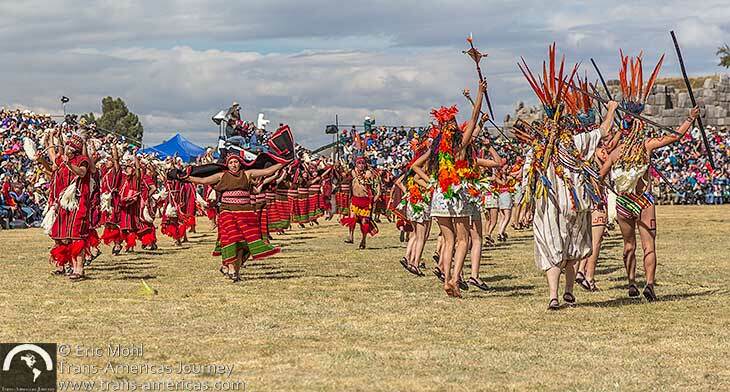 The Incas confirmed their new year every June 21 based on sophisticated and shockingly accurate sun observations. 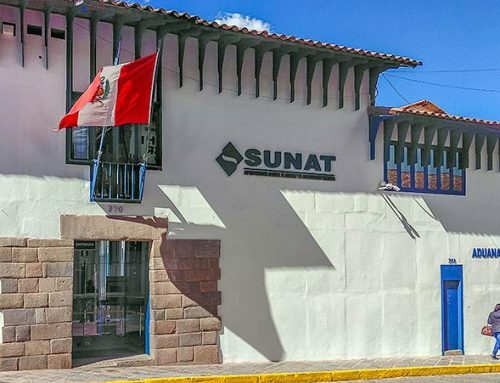 Inti Raymi (which means Sun Festival in the Quechua language) is celebrated on June 24 because it took a few days for the Incan Chaski runners to get the word out to all corners of the Incan empire. 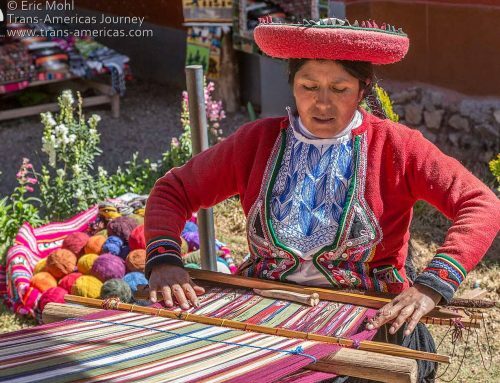 We are told the Incas didn’t count years, perhaps out of an abundance of confidence that their culture would last forever. Therefore, there is no new year count so a fresh numberless year begins every June 24. 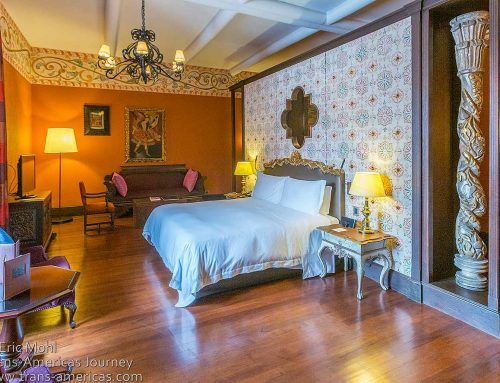 Inti Raymi is celebrated throughout the Andes, but the Inti Raymi festival in Cusco is famous for a reason. 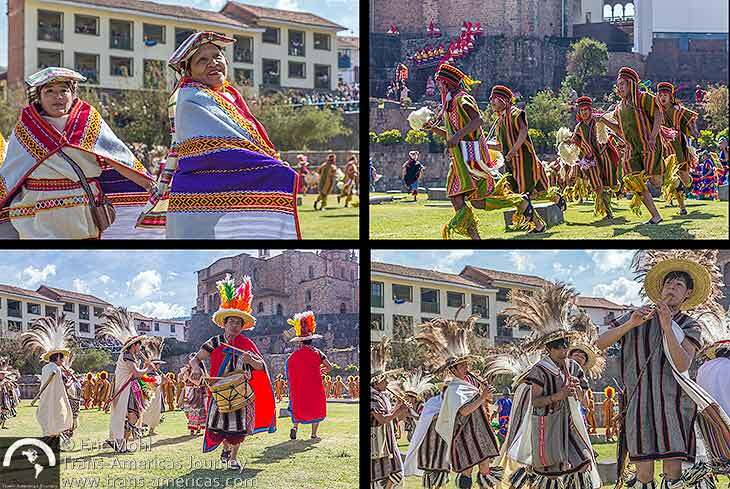 Experience the colors, costumes, dancing, and tradition that unfurl during this one day, 3-part festival in our photo essay. 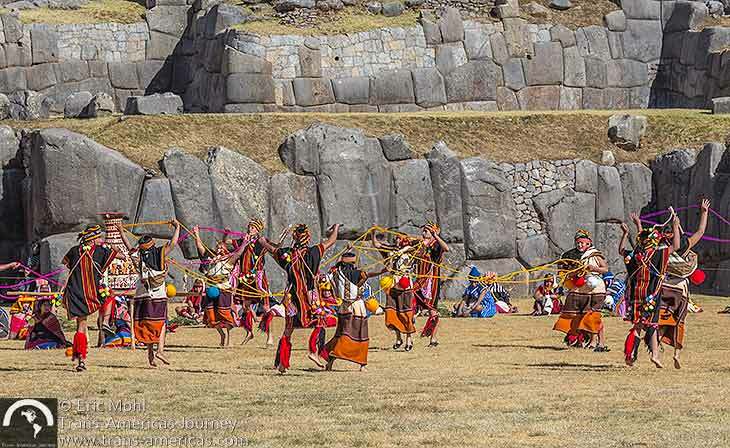 Get started with our Inti Raymi video, below. 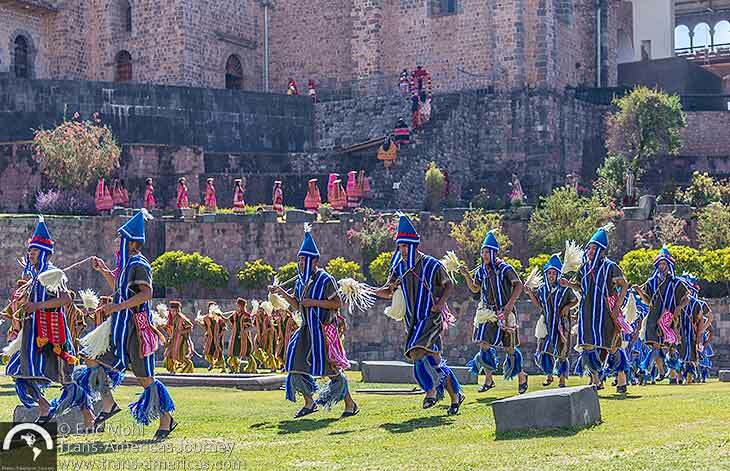 At 9 am on the morning of June 24 hundreds of costumed dancers, depicting the people who were conquered by the Incas from all “suyos” or parts of the region, converge at the Qorikancha Sun Temple adjacent to the Santo Domingo Church. Over the next hour or so they take part in solemn dances and processions from inside the church (which was built by Spanish conquistadors on top of the most important temple in the Incan empire) down onto a large lawn. Some people play flutes, others bang on cowhide drums, some men blow conch shells and crack whips. 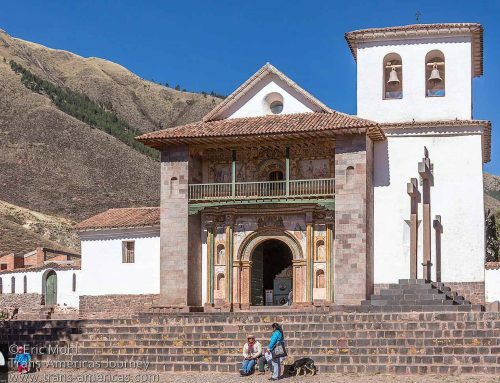 The Incan king eventually appears on top of an amazingly precise curved wall which the Incas built as part of their temple and which is still part of the church complex. From there the Incan king issues a decree marking the end of this portion of the festival. 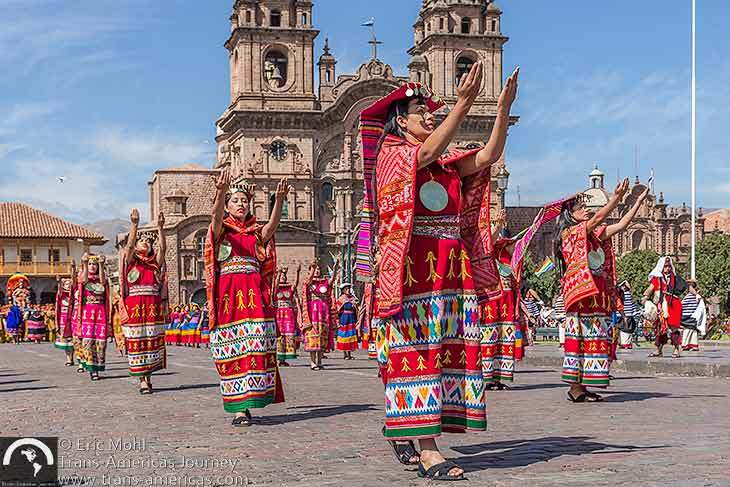 Hundreds of costumed dancers take part in the first phase of the annual Inti Raymi festival in Cuzco, Peru which takes place at the Qorikancha Incan temple under the Santo Domingo church. 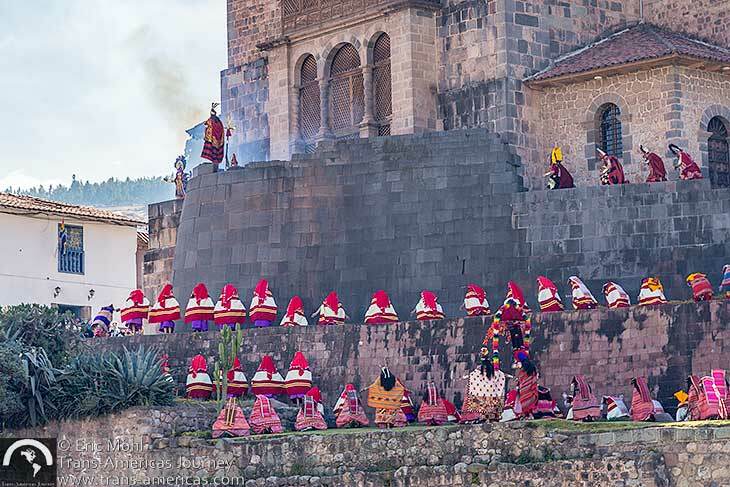 The Incan king makes his proclamation during the first phase of the annual Inti Raymi festival in Cuzco, Peru which takes place at the Qorikancha Incan temple under the Santo Domingo church. 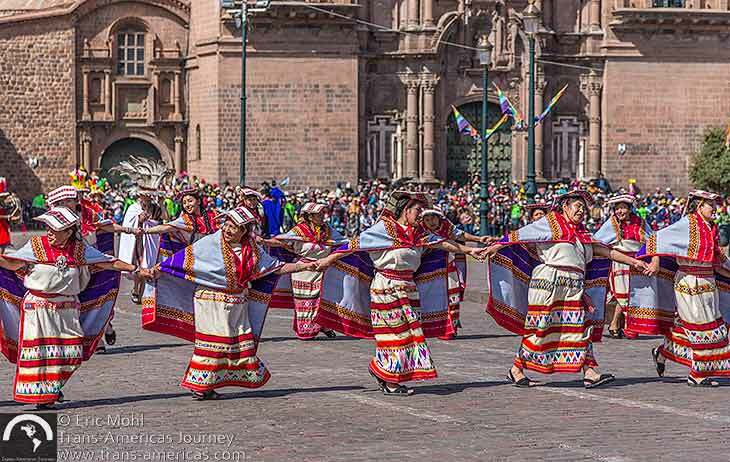 The whole crew from Qorikancha parades to the nearby Plaza de Armas where, from 10:30 am to 11:30 am, the dancers continue to parade around the square with the addition of some new costumes and new characters. One man is dressed as a deer with antlers painted gold. Another man makes an offering of coca leaves on an elaborate blanket and scatters the leaves to the wind. 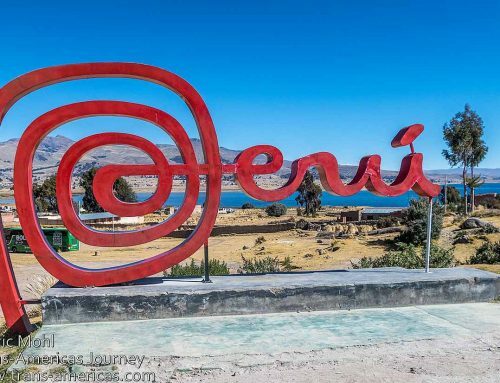 Then the Incan king climbs up the statue in the center of the plaza, which depicts the mighty Incan ruler Pacahcuti, and makes another proclamation which includes passing power to the current mayor or Cuzco, which elicits some laughter from the crowd. Then the dancing resumes. 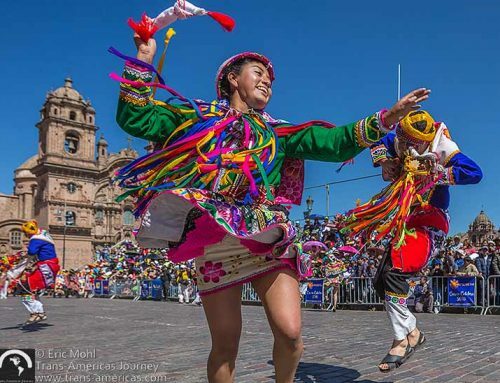 Dancers keep the festivities going during part 2 of the annual Inti Raymi festival in Cuzco, Peru which takes place in the Plaza de Armas. 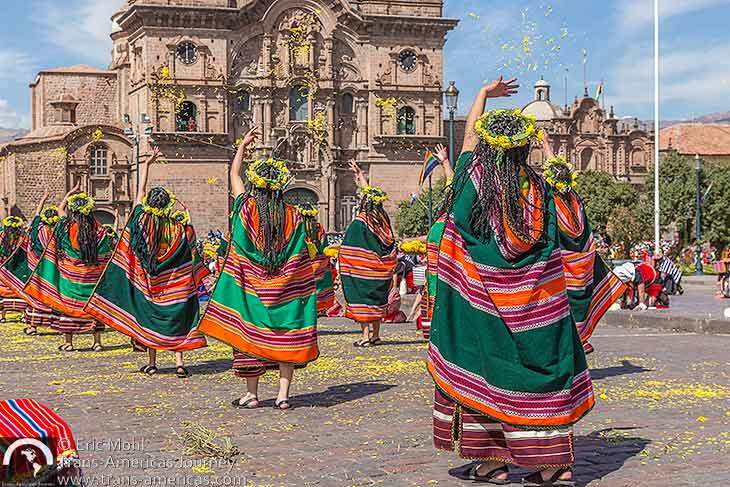 Yellow flower petals are scattered in the Plaza de Armas in anticipation of the arrival of the Incan queen during the annual Inti Raymi festival in Cuzco, Peru. 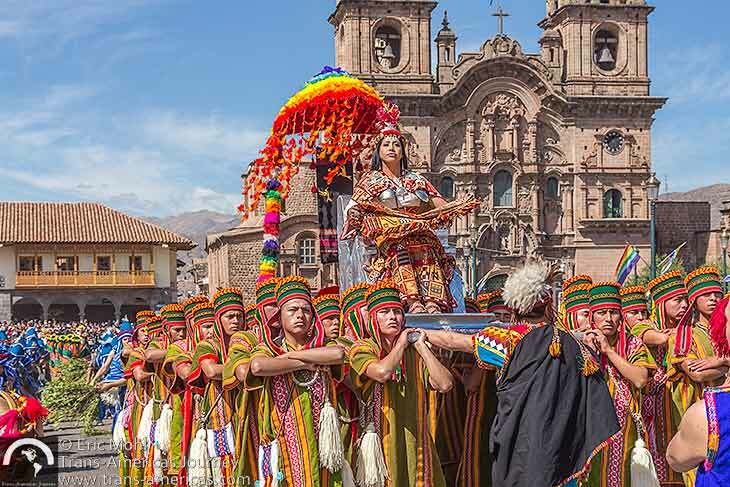 The Incan queen arrives during part 2 of the annual Inti Raymi festival in Cuzco, Peru. 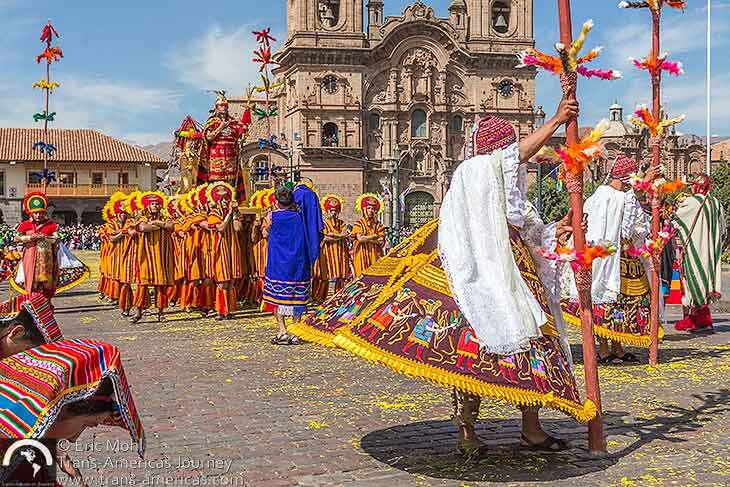 The Incan king arrives during part 2 of the annual Inti Raymi festival in Cuzco, Peru. 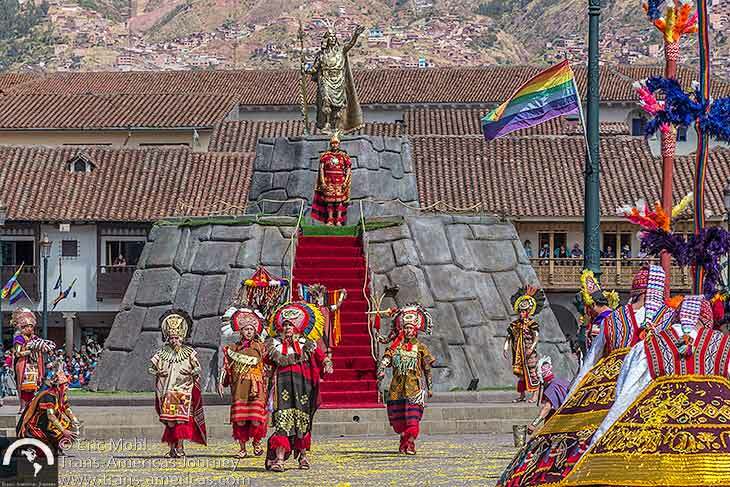 The Incan king climbs stairs placed around the statue of the mightly Incan ruler Pachacuti to give a proclamation during part 2 of the annual Inti Raymi festival in Cuzco, Peru. 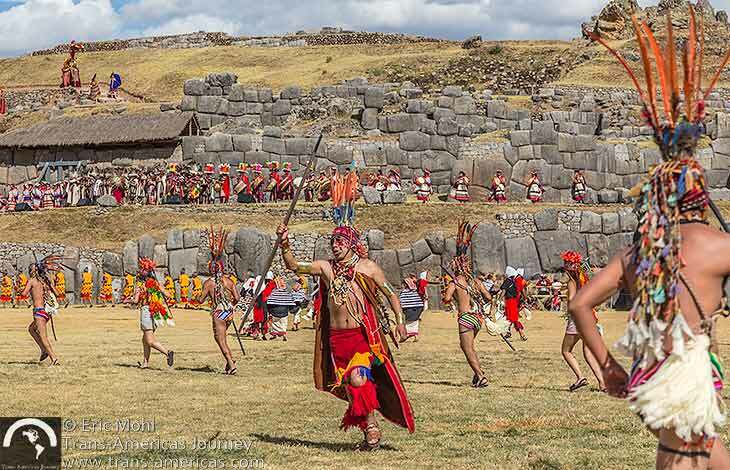 The Inti Raymi festival culminates at the Saqsayhuaman archaeological site above town. From 1:45 pm to 3:30 pm the original dancers gather along with some new characters and some items on litters including huge pottery and huge frogs. 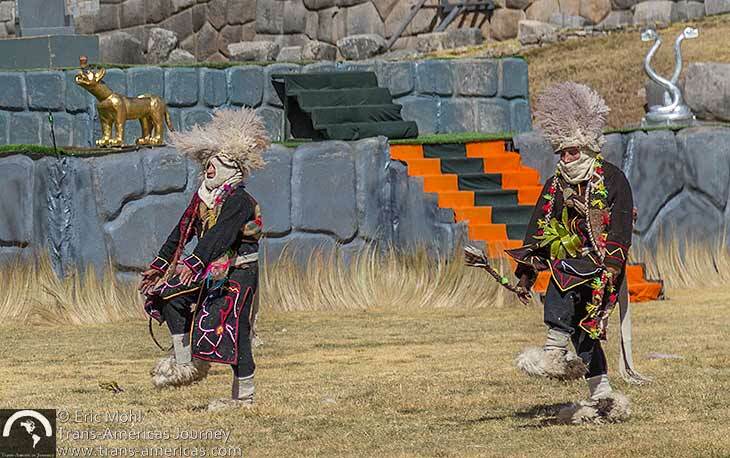 During this final part of the festival, there’s less dancing and more pomp and circumstance around the Incan king including the simulated sacrifice of a black alpaca. 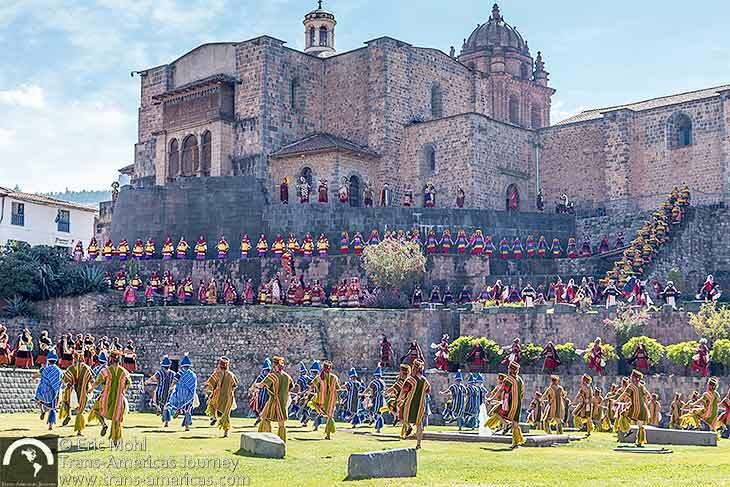 This is the most popular part of Inti Raymi and attracted an estimated that 50,000 people when we were there. 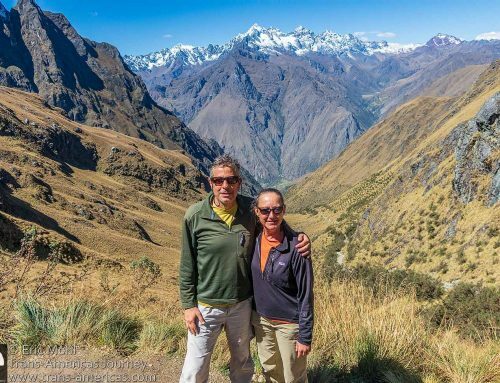 Tickets are required if you want an up-close experience (see Init Raymi travel tips, below). 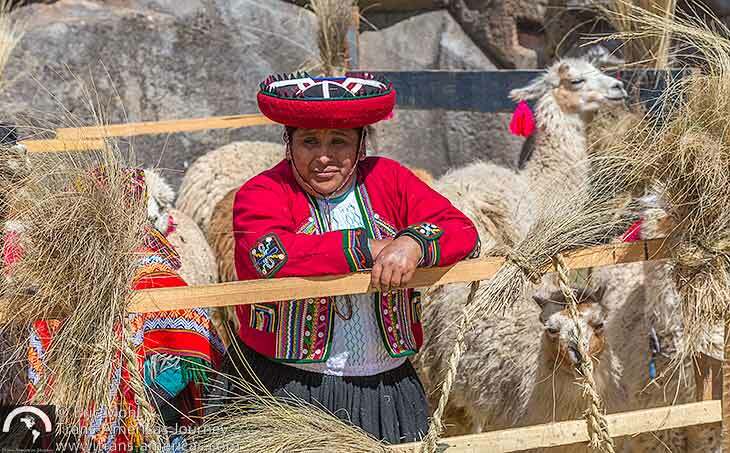 A woman tends some llamas which are involved in part 3 of the annual Inti Raymi festival in Cuzco, Peru. 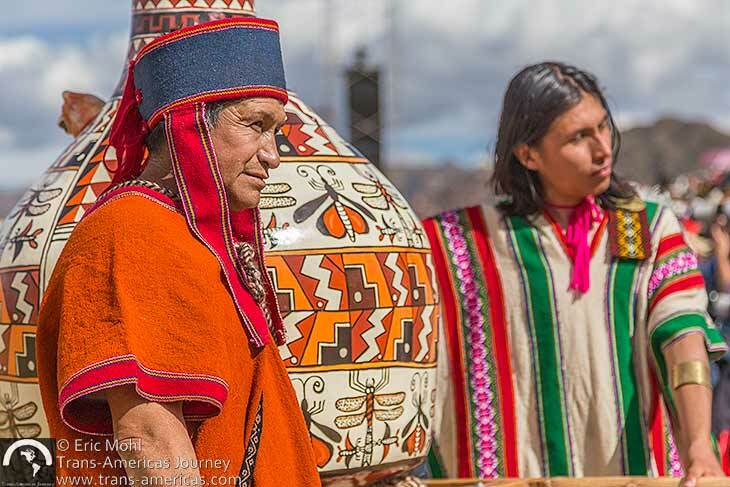 Costumed participants carry a large piece of pottery during part 3 of the annual Inti Raymi festival in Cuzco, Peru. 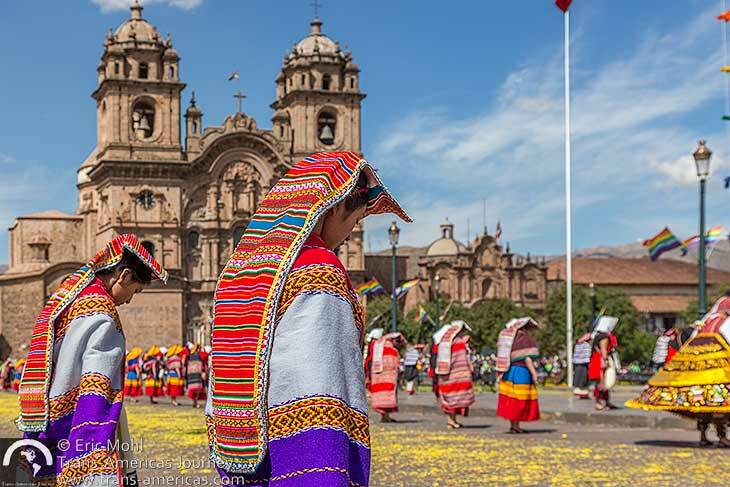 One of our favorite costumes during part 3 of the annual Inti Raymi festival in Cuzco, Peru. 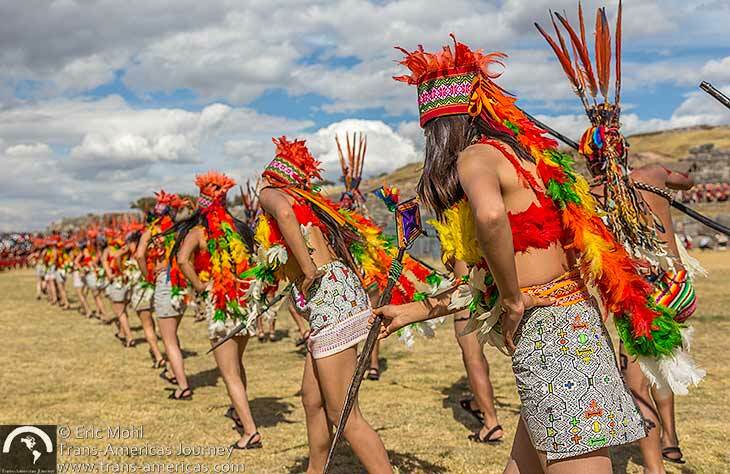 These costumes are inspired by traditional textiles and materials used by people living in the Amazon region. 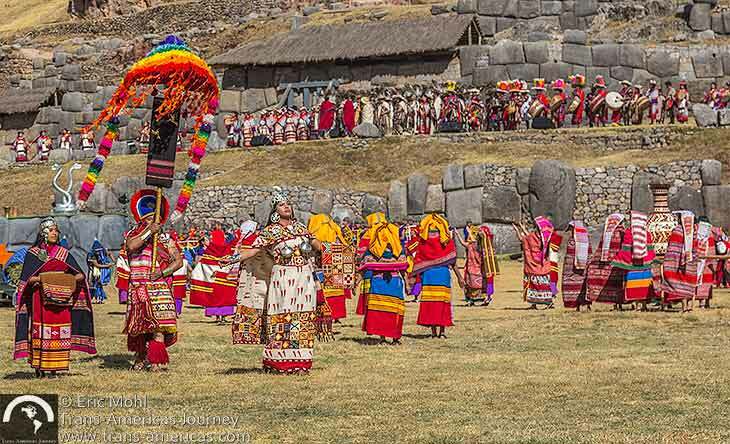 The festivities come to a head at the Saqsayhuaman archaeological site during annual Inti Raymi celebrations in Cuzco, Peru. 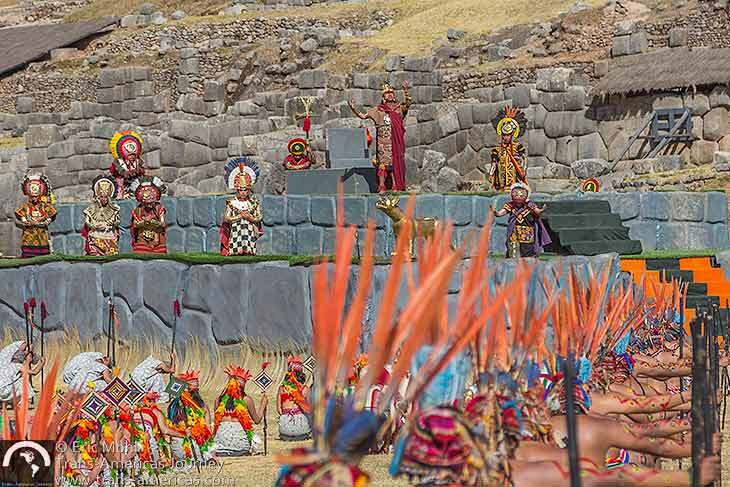 The Incan king makes yet another proclamation during part 3 of the annual Inti Raymi celebrations in Cuzco, Peru. 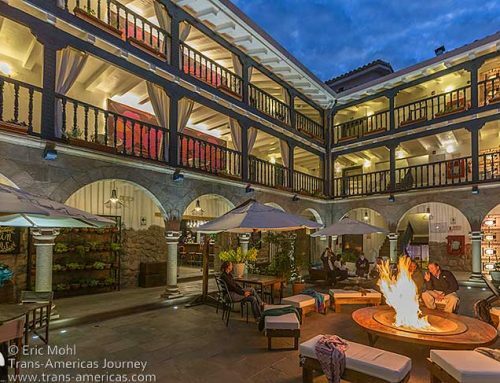 You don’t need tickets to access part 1 and part 2 of the Inti Raymi festival in Cuzco, just show up early to get a spot with a good view. 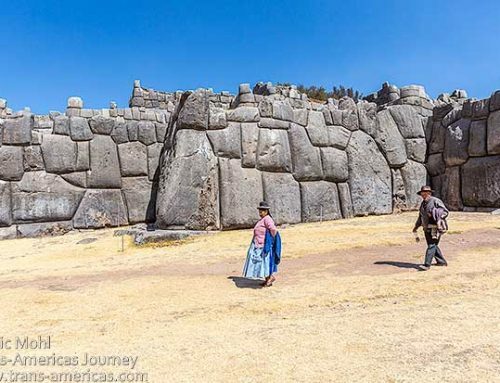 There’s a ticket-free viewing area at Saqsayhuaman during part 3 of the festival as well. But if you want an up-close view (and you do) you’ll need to buy a ticket in advance. Red section tickets give access to bleachers that directly face the altar in the middle of the large plaza where the dancing and ceremonies take place. However, photographers will want to note that the background for shots from these seats is another set of bleachers behind the altar which is where those with green tickets sit. 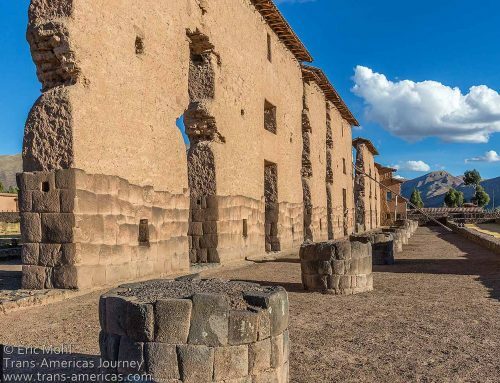 The orange section of bleachers has an angled view of the altar but the background of your photographs is the massive rocks used to make the walls at the Saqsayhuaman site. 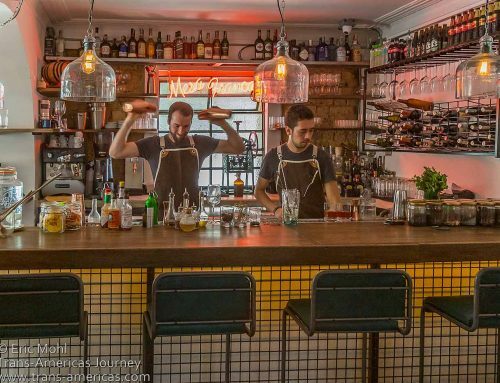 You can buy tickets and come on your own or join one of the many tour groups which take travelers to this part of the festival including a packed lunch and transportation. Wear a hat and sunscreen. 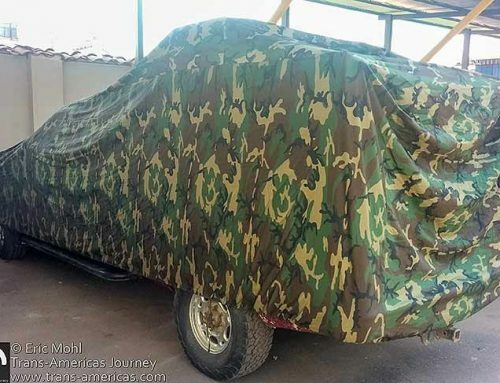 There is no shade.